Compact premium series automatic meteorological stations that combine precision measurements, rugged construction, versatility, research-grade accuracy, and incorporate Smart Sensors, multi channel loggers, and various communication options. Very easy to set-up. No special languages to learn or training courses to attend. Individually calibrated, high precision, 16 bit digital sensors. Every sensor is also a logger and stores the last 3 years of readings internally as a back-up, independent of the main logger memory. The logger incorporates a Programmable Logic Controller (PLC). Runs pumps, motors, fans, irrigation etc dependent on current sensor readings. Very easy to program. Solar powered, micro current consumption. Web connected with optional data modem. Connects to USB and RS232, with options for Ethernet or Bluetooth. Will log latitude and longitude if GPS plugged in. Add new sensors at anytime (up to 50 extra sensors) and the logger will find them immediately and start logging without user intervention. Sends warning SMS on user defined levels and answers SMS enquires (with optional data modem). Very rugged, powered-coated aluminium, construction. 24 month warranty on all components. Temperature sensors for grass, leaf, water, black globe, or soil. Soil moisture, Sap flow, Sap Velocity, Heat flux, PAR, UV, Water depth, Flow, EC, pH, ORP, Selective Ion, Gas sensors, Vertical Wind Speed, Lightning Strike, Leaf wetness, Voltage, Current, Logic, plus interfaces to connect specialized sensors from other manufacturers. A weather station with complete suite of wireless solar powered sensors for wind speed, wind direction, relative humidity, dewpoint, inside/outside temperature and rainfall for meteorological measurements. 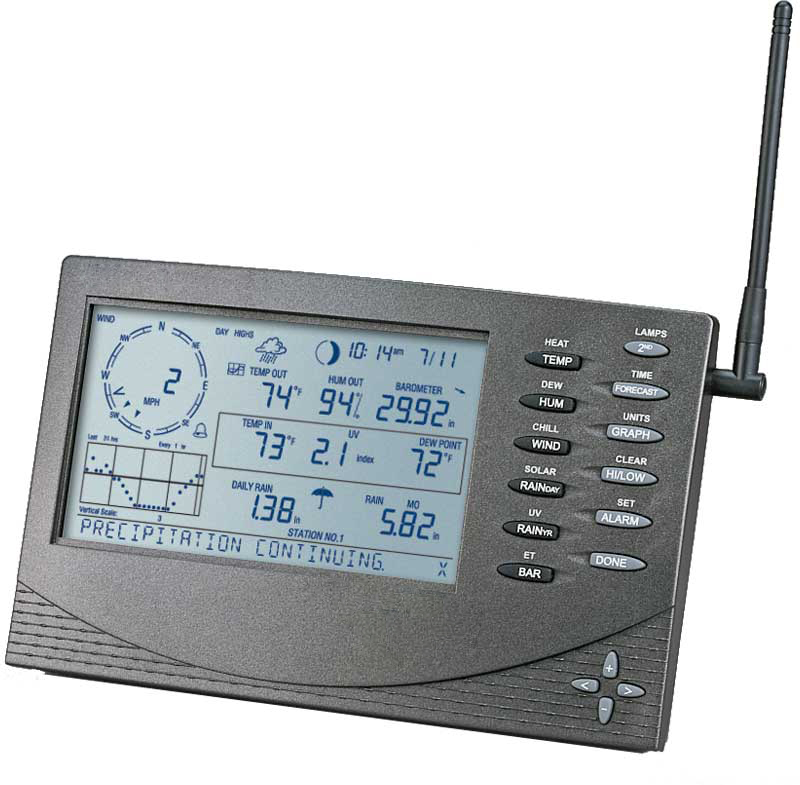 The VP2 wireless weather station includes a desktop console which includes an LCD display and keypad plus internal barometric, humidity and temperature sensors for indoor measurements. 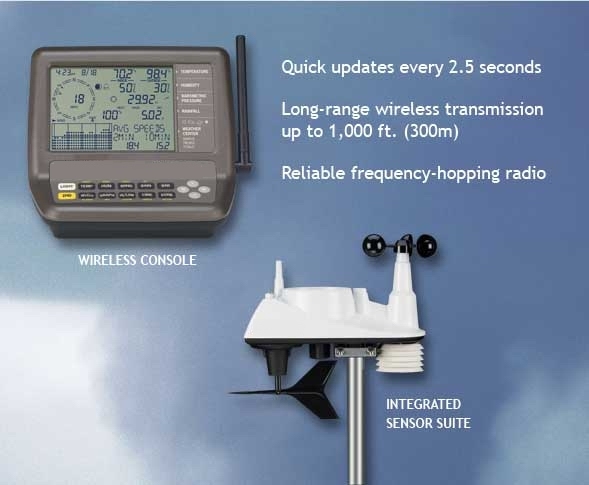 The wireless integrated sensor suite (ISS) includes windspeed, wind direction, rain gauge, air temperature and a humidity sensor to provide a comprehensive set of meteorology measurements. The VP2 Plus wireless weather station has a solar radiation and UV sensor in addition to the standard meteorological sensors. Both the VP2 and Pro2 Plus weather stations have as standard a radiation shield for improved accuracy of the temperature and humidity measurement. For even better accuracy there is also the option for a solar powered fan aspirated radiation shield (FARS). An additional option includes software and a data logging module which is installed into the back of the VP2 wireless weather station and allows you to produce weather trend reports with graphs & summaries, create your own weather website or participate in international weather related science programmes. 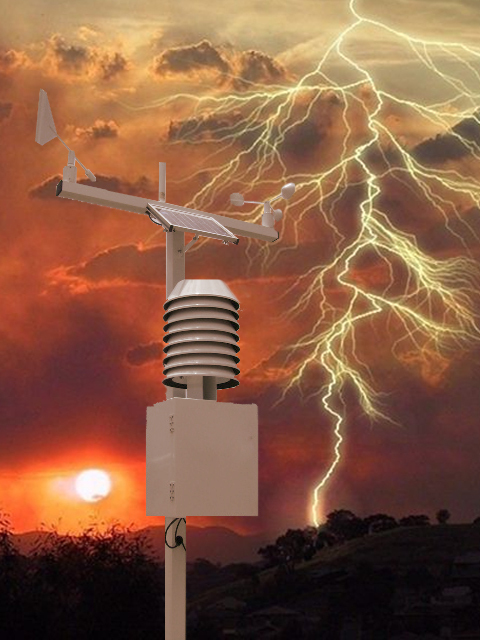 The VP2 weather station can be used with up to 8 separate wireless sensor stations, but there is a limit on certain types. In additon to either a combined or two separate partially populated leaf & soil moisture/temperature stations you can also specify up to 7 temperature station or temperature & humidity station. There is also a wireless anemometer (wind speed and direction) transmitter kit if you need to separate the anemometer from the integrated sensor suite to mount in a different location without using the 12 metres of cable supplied as standard with the anemometer. The distance between the weather station console and a wireless sensor station can be up to 300 metres (1000 feet) in the line of sight or 60 to 120 metres (200 to 400 feet) through walls. For greater distances solar powered wireless repeaters can be added with each extending the range by 300 metres (1000 feet) in line of sight or 60 to 120 metres (200 to 400 feet). These can be daisy chained to link with a distant sensor station or network up to 8 sensor stations to a maximum distance of 1 km. Parts included with base model are desktop console, AC adaptor, wireless integrated sensor suite and clamping brackets. A cabled version model is also available. anemometer, inside and outside temperature sensors, junction box, and console. The console provides A/D conversion, calculations, and data display. A DC-power adapter and an 8` (2.4m) cable (for connecting the junction box and console) are included. Options include the Rain Collector, and interface (# 7862) which provides data logging and a serial interface to a computer. Wind Chill Resolution and Units . . . . 1°F or 1°C.°(nominal).Celsius is converted from Fahrenheit and rounded to the nearest 1°C. 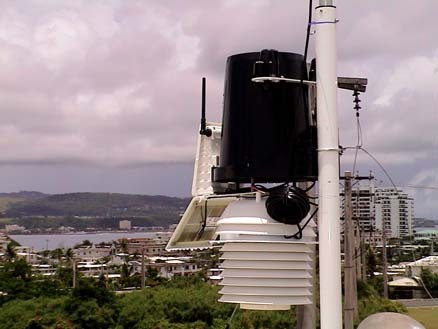 The newest wireless weather station provides accurate, reliable weather monitoring in a self-contained, easy-to-install system. The V V gives you all the weather data you need for home use, education, boating and more. Sleek but tough—your outdoor sensor suite sets up in minutes and starts sending data wirelessly to your console anywhere in your home, school, or business. 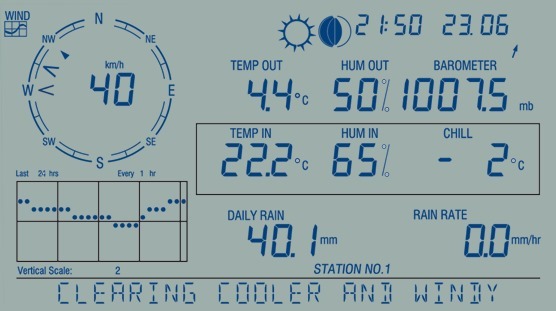 You`ll see current weather conditions, including indoor and outdoor temperature and humidity, barometric pressure, wind speed and direction, dew point and rainfall. You`ll also get weather forecast icons, moon phase, sunrise/sunset times, graphing of weather trends, alarms and more. V V also boasts the innovative Weather Center button that displays additional data on weather variables for today and over the last 25 days. Now you can post your weather data directly to the internet without a PC! Not a web guru? Don`t worry--the optional newest version of interface does all the work for you. Automatically upload data to third-party weather sites including Citizen Weather Observer Program, the GLOBE Program, and more. Get e-mail alerts for current weather conditions or simple alarm conditions. Download the data to your PC for all the powerful charting, graphing, and analysis. With Extra User License Kits, you can even download the data independently to multiple PCs—ideal for schools, agriculture, scientific fieldwork, and remote locations. Choose a logging interval of 1, 5, 10, 15, 30, 60, or 120 minutes. Records wind speed as low as 3 km/h (2 mph) and as high as 241 km/h (150 mph). RAIN COLLECTOR: Self-emptying tipping spoon measures rain with 0.2 mm resolution for OV ISS and .01" resolution for US ISS. ANEMOMETER: Vantage Vue records wind speeds as low as 3 km/h (2 mph) and as high as 241 km/h (150 mph). TEMPERATURE/RELATIVE HUMIDITY: Provides outside temperature readings from -40°C to 65°C (-40°F to 150°F). Also measures relative humidity from 0 to 100%.